During the winter, a home’s fireplace often becomes a gathering spot where the family can relax and socialize. After all, nothing beats the cozy warmth that a fireplace provides. If you’re a Chattanooga homeowner who delights in this ambience but also wants your fireplace to serves as a distinctive centerpiece, 31-W Insulation recommends our marble fireplace surrounds. Made in a variety of styles to suit your home’s décor, these surrounds are as functional as they are elegant. At 31-W Insulation, we hold ourselves fully accountable in everything we do. That’s why we rely only on our trusted employees for all of our projects, including fireplace installations. Highly skilled and experienced, our technicians will install your new surround with expert precision. They will treat you and your home with respect, keeping disruptions to your household activities to a minimum and leaving their work area spotless after the installation is finished. The marble surrounds we offer come from ICM Marble and Granite, a world-renowned company that supplies marble excavated from select quarries around the globe. True artisans design and craft our surrounds with consummate care. This means the marble surround that we will install in your home has been meticulously cut according to old-world standards and fastidiously polished to achieve a high gloss. As beautiful as it is to behold, your new marble fireplace will be no less functional than a normal fireplace. Plus, with an elegance that commands attention, it will quickly become your home’s centerpiece, burnishing your home’s aesthetic and boosting its value. 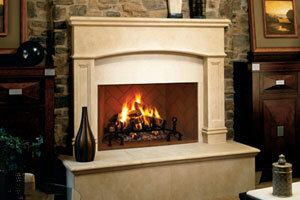 To start the process of acquiring a new marble fireplace for your Chattanooga home, contact 31-W Insulation today. One of our representatives will be happy to schedule a free consultation at a time that’s convenient for you.